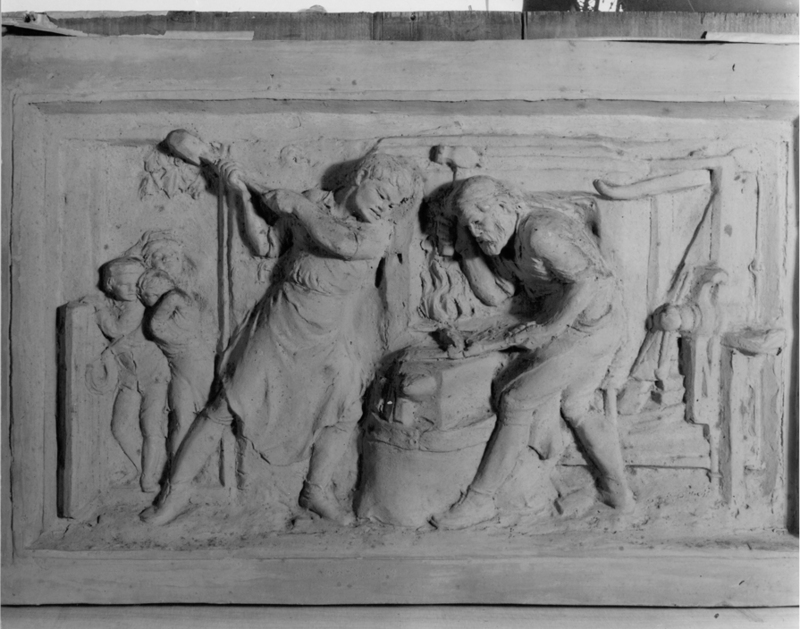 This terracotta relief evokes the dignity of labour, an idea at the heart of Ruskin's social philosophy. In The Stones of Venice, he had spoken of the 'fatal error of despising manual labour when governed by intellect' (Works, 10, p. 201). He complained that 'we want one man to be always thinking, and another to be always working [...] whereas the workman ought often to be thinking, and the thinker often to be working'. Creswick's relief pays homage to Ruskin's belief in the ideal union of the intellect and the body. The muscles of the blacksmith expend brute force, but that force is guided by skilful handling of the hammer, and intelligent co-operation with the fellow worker. A productive outcome is suggested by the presence of the children in the background, who gain sustenance by the labour of their parents. A revealing contrast is suggested by Dickens's portrayal of Joe Gargery's forge in Great Expectations. The novel's hero, Pip, resents the confinement of apprenticeship as a blacksmith; only after gaining a fortune and an education does he come to regret his separation from the 'honest' values of the forge. Creswick eventually became a professional sculptor, and took up the post of model-master at the Birmingham School of Art.